Just over 10 years ago (where did the time go?!) 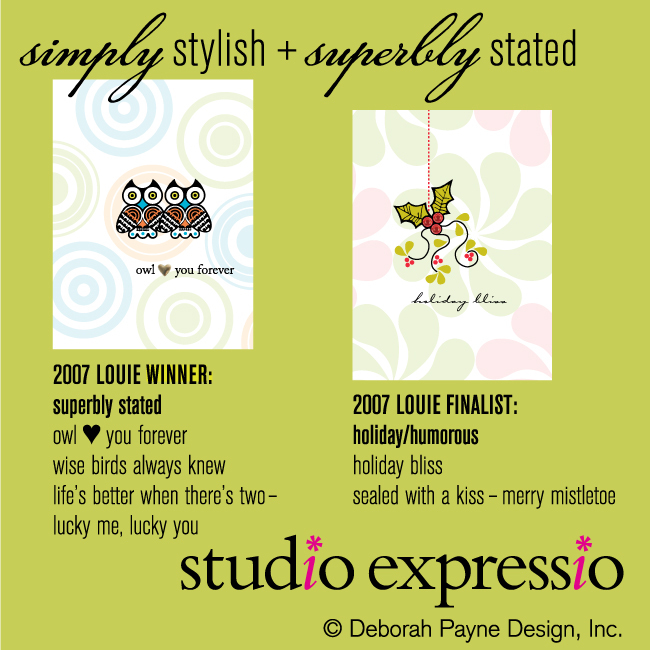 I spent a few years designing for the Greeting Card Industry. It was fun, exciting and truly a family venture. My daughter Valerie wrote many of the verses and coordinated our marketing efforts. My son-in-lay Chris created a number of beautiful illustrations and my husband Dwight and daughter Carolyn helped with day to day operations. My daughter Joelle joined us at the Stationery Show and was a great help in our booth. Two greeting cards won prestigious Louie Awards that year, and another Louie was awarded the following year. After a few years of loving this industry I took a break to teach Adobe Illustrator, Typography and Color Theory at the community college while I also enjoyed working as a contract graphic designer for a few wonderful clients. I embrace change and love a challenge, bringing me to my new passion for surface pattern design and illustration — with a trip to NYC in May where I’ll exhibit at Blue Print!